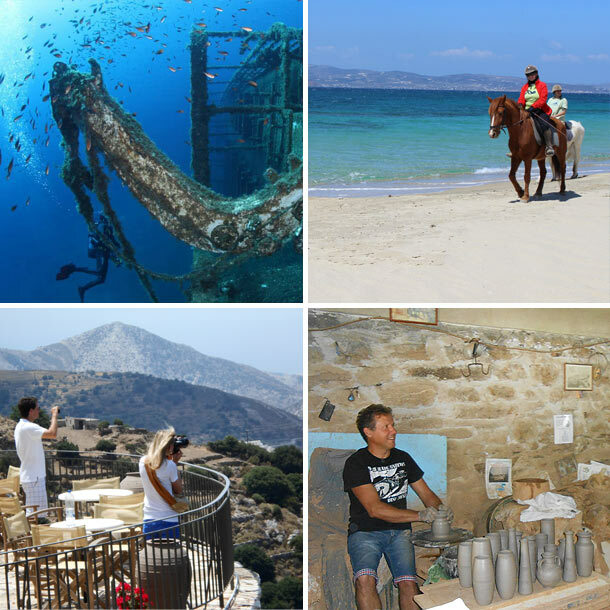 See and experience the real Naxos with our guide Spyros, a native Naxian who has lived on the island his entire life. Choose a full-day tour, which includes a delicious, homemade lunch at a charming, mountain village tavern. Follow a pre-devised itinerary, or let Spyros know your interests, and he will create a personalized tour just for you. · FIRST STOP: History comes alive at the ancient temple of Demetra, in Sagri Village, dated 530 BC, and dedicated to the goddess of agriculture. Built on the edge of a fertile Naxian valley, as the first Greek temple constructed entirely of marble (its roof as well), it’s of even greater historical importance. · SECOND STOP: Be charmed by Chalki Village, where after a pleasant stroll, visit the hundred-year-old family distillery, which still produces Naxos’ well-known KITRON liqueur. · THIRD STOP: Visit ancient Panagia Drosiani, an Early Christian, trio-apsidal, domed church with its beautiful frescoes. · FOURTH STOP: The traditional and picturesque, marble mountain village of Apeiranthos is next, where you will enjoy sauntering along its winding paths, admiring its charm. The views from nearby Stavros will offer you the island’s unique view of both its east and west sides, simultaneously. · FIFTH STOP: Historic Koronos Village, once world-famous for its abundantly productive, highest quality, emery mines. At this traditional mountain village, you’ll savor a fresh and delicious, homemade lunch at a characteristic, family-owned taverna; the meal is prepared almost entirely of their homegrown, raised and produced, products. And virtually ten steps from your table, you can drink from a mountain spring! · SIXTH STOP: The small fishing village on the island’s northeast coast, Apollon Village. The highlight here is visit to the famous Kouros marble statue, dating to about 550 BC. · SEVENTH STOP: Delightful Eggares Village, where you will visit a renovated, family-owned olive oil factory, where you can watch how this “liquid gold” was once painstakingly prepared, as well as sample its delectable olive oil products. · End your entertaining and informative day as you wind along Naxos’ scenic roads to your Chora hotel. Tour includes pick up and drop off at your hotel. Our tours are conducted in English in either private cars (up to 4 pax) or our luxury minivan (5-8 pax).